Update 5/31/16: The glitch has been addressed in iOS 9.3.1. Apple released iOS 9.3 today, which contains lots of enhancements and fixes. One of these fixes solves an issue with the Calendar app (for those still not using the Outlook app), where it would send multiple responses for an invite. The fix supposedly solves issue 1.15 from the “Current issues with Exchange ActiveSync and 3rd-party device” overview (KB2563324), “Meeting organizer receives multiple responses from attendee. The related KB article, KB3108212, also contains instructions on how to identify users experiencing this problem. Note that the problem has also been addressed server-side in Cumulative Update 1 for Exchange 2016. It’s almost a law that, for every bug that is fixed, new ones are introduced. So, some organizations may therefor want to test and accept this iOS update before giving it the green light for their Exchange environment. To block a specific version of iOS from Exchange, consult the instructions here. Out of nowhere, news came yesterday from the Chicago Tribune that Microsoft cancelled the Microsoft Ignite event at Chicago for 2016. Originally, the Ignite event, replacing former events like MEC, LyncCon, MMC and SPC, was said to be held for 4 consecutive years in Chicago, starting in 2015. Even at Ignite 2015, it was confirmed Ignite 2016 was going to take place in Chicago from May 9th to May 13th, 2016. Without any reason given for this change of plans, although rumors are that either bad feedback on this year’s event or product release schedules could be the reason for changing plans, today Microsoft announced that Ignite 2016 will take place in the Georgia World Congress Center in Atlanta, from September 26th to 30rd, 2016. This date is perhaps a bit too close for comfort to that other well-known event, the independent IT/DEV Connections which is scheduled for September 19th to 22nd, 2016 in Las Vegas. It remains to be seen if Penton – organizer of the IT/DEV Connections – moves their event or not. Apart from potential schedule issues, though there are worse things than potentially staying half the month September in the US, it could pressure budgets for organization who want to have people attend both events, without the option to spread those investments.This is of course also true for those that are self-employed. You can pre-register for Ignite 2016 here. More information on Ignite is available here. After Apple released iOS 9 to the public yesterday. From an Exchange or Office 365 perspective, iOS 9 supports the enhanced calendar features of Office 365 and Exchange 2016 when that is released. Unfortunately, incidents have been reported with the Outlook app and the Lync 2013 App. Regarding the Outlook App, iOS9 users might not be able to start the Outlook App or the Outlook app will just crash. The far from ideal workaround offered by the Outlook team, is to reinstall the Outlook app. This will product a list of users, the name of their device, the device model and OS and when it last synced with Exchange. This information can be useful when you want to proactively approach users with iOS8 devices. “This problem is fixed in the Microsoft Skype for Business for iOS app that will replace Lync for iPhone and Lync for iPad when it’s released. No fix for this issue is scheduled for the current releases of Lync for iPhone and Lync for iPad”. Since the Skype for Business app is not available yet, this is not good news. Mitigation is possible by matching the region with the language setting (or the other way around), after which you need to reinstall the Lync 2013 app from the store. If you would like to know more about the Access/Block/Quarantine option, check out this article. Exchange out-of-office message can now be edited separately for external replies. Improves recovery of Exchange accounts from temporary connection problems. Fixes an issue that caused Exchange meetings with long notes to be truncated. As for any update, I’d recommend to thoroughly test this in a test and acceptance environment first, prior to allowing access to your production environment. Apart from potentially blocking the new iOS, monitor the support forums from Apple and Microsoft for related issues. To block a specific version of iOS, consult this page. More information on known issues with Exchange ActiveSync and 3rd party devices can be found in KB2563324. However, some existing complaints are not resolved by this update, such as the WiFi performance issue. It is a natural law that for every bug that is fixed, new ones are introduced. So, some organizations may therefor want to test and accept this iOS update before giving it the green light for their Exchange environment. To block a specific version of iOS, consult this page. More information on current issues with Exchange ActiveSync and 3rd party devices can be found in support article KB2563324. OWA for iPhone and OWA for iPad are here! Today, the Exchange team announced the immediate availability of the (free) OWA for iPhone and OWA for iPad apps. Exchange fellows Tony Redmond and Dave Stork already hinted earlier this month that something was about to happen in this area. Remote wipe capability (user data, when the app runs). That last one is a great, much requested feature when Bring Your Own Device is practiced (apart from that it makes sense due to the sandboxing principle). When required the business can selectively wipe business data without touching your personal information, similar to a feature to be introduced with Windows 8.1 called Remote Business Data Removal. Besides that you need an iPhone 4S or iPad 2 or higher running iOS 6 or later, the apps are currently only supported for Office 365 subscribers running the tenant on Wave15 (or later). There are reports of the apps working with on-premises Exchange 2013 but that’s unofficial. To find out which version your tenant is running, use Get-OrganizationConfig in a remote PowerShell session, e.g. My tenant is running on 15.0.698.10 (15 = Wave 15), so theoretically I’m good to be running OWA for iPhone or OWA for iPad. I say theoretically, as I don’t have any iPhone or iPad available for testing. An app version for on-premises Exchange 2013 is expected to be released at a later date. More information on configuration and usage of the OWA apps on the Office 365 blog here. Most of you listen to or at least are aware of our The UC Architects podcast. If not, The UC Architects is the world’s most popular community podcast on Exchange and Lync made by people with a passion for Microsoft Unified Communications. 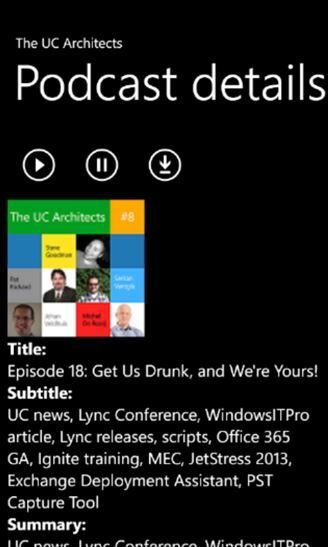 Now, as of today and thanks to fellow Johan Veldhuis, you can keep track of new podcasts when travelling, check our Tweets or even download and listen to podcasts using the UC Architects Windows Phone App. The app is available for Windows Phone 7 and 8. More information on the app itself can be found on our The UC Architects website.